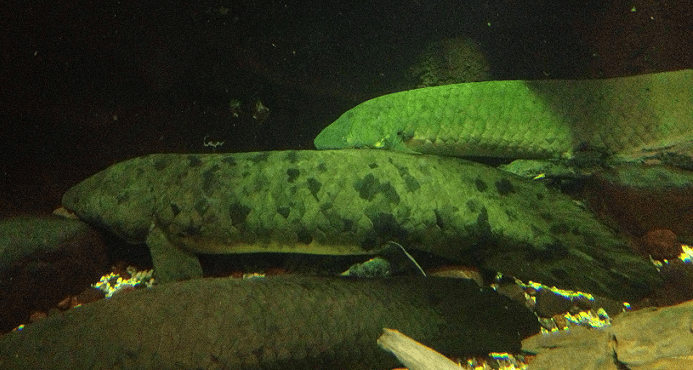 Adult Australian Lungfish, part of a captive breeding program in Queensland, Australia. On Sunday, February 5, 2017, Granddad the Australian Lungfish, the oldest fish in any aquarium or zoo, was euthanized due to health complications. Although his exact age is unknown, he arrived at Shedd Aquarium in Chicago as an adult in 1933. 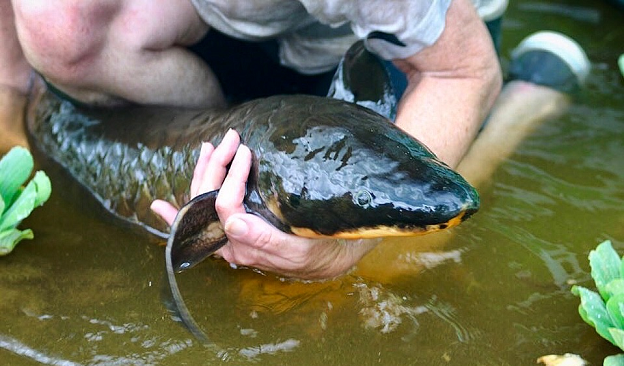 Australian Lungfish (Neoceratodus forsteri) take over a decade to mature, so we can estimate he was over 90 years old when he passed. The Australian Lungfish is a unique species, considered a “living fossil”, resembling its ancestors whose lineage dates back over 380 million years. The Australian Lungfish genus (Neoceratodus) itself has been around for about 100 million years. When first described, they were believed to be amphibians; one look at their elongate body and flipper-like fins, and you can imagine the classification conundrum. The fish even possesses a primitive lung, allowing it to breathe air in low-oxygen environments (although they usually breathe with their gills). Natural history aside, stories circulated widely about the passing of the beloved fish (he recently celebrated his 80th anniversary at Shedd Aquarium to much fanfare). Granddad was described as often “imitating a fallen log” but sparking wonder in visitors who heard his story, the first of his kind on exhibit in the United States. It was estimated that over 104 million visitors saw the fish during his time at the aquarium, which fulfills the modern-day need to calculate impressions for social media. Granddad was no penguin or dolphin, but he certainly got a lot of “likes” for an oddball ancient fish. Amidst these stories, however, there is a lack of acknowledgement of a key purpose of having Granddad on exhibit all these years: serving as a conservation ambassador. Although originally imported in 1933 to attract visitors from the nearby “A Century of Progress International Exposition”, Granddad was more than just a novelty species that lived a long time playing log-fish. He was representative of a vulnerable, protected species now relegated to a small corner of Queensland, Australia; a species facing habitat loss and expected population decline due to dams, a species that we still know very little about. Due to a lack of sufficient data on their populations and behavior, fishery managers may not be able to make appropriate conservation decisions for the species. Previous studies showed river connectivity and abundant vegetation are vital, but more research (and outreach) is needed on this cryptic fish. Having Granddad (and several other Australian Lungfish) on exhibit was meant to bring this conservation message to the public, or at least should be. With his passing, there has been much media attention, but the conservation story (or plight) hasn’t been told; this is a missed opportunity. Aquariums and zoos in the 21st century have a responsibility to present the story of the species, not just the individual. Granddad was not merely an elderly oddity, but served as a link to the wild places many may never see in person, a representation of biodiversity that is important to conserve, especially when under human-made threat. As someone with a great appreciation for ancient, under-dog fishes, I am sad to hear about Granddad’s passing (I visited him many times), but I strongly believe it’s our responsibility to couple stories of these animal ambassadors with conservation science, and share that message with the public, especially when the opportunity arises. This week lungfish probably received more attention across social media than any time prior. Although a single animal is lost in a zoo or aquarium, many more are often lost in the wild due to human impacts. We need to make sure the conservation story of Granddad’s species is told; I like to think it’s what the old fish would have wanted, regardless, it’s our responsibility to do so. Kind, P. 2011. 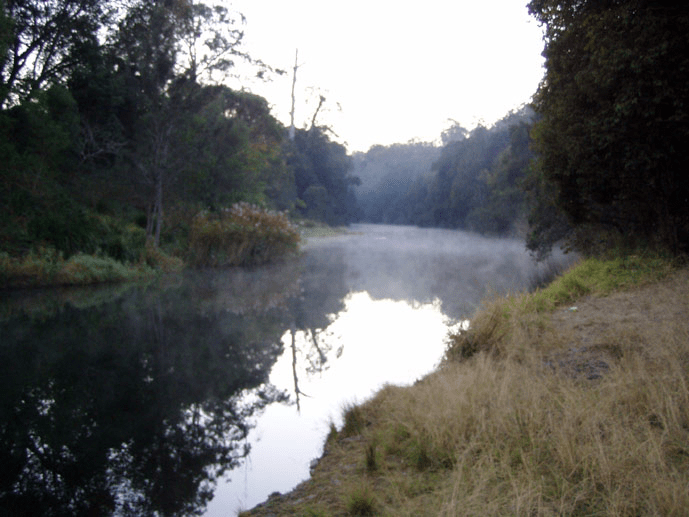 Natural History of the Australian Lungfish. In The Biology of Lungfishes, eds. J.M. Jorgensen and J. Joss, 61-95. Enfield, New Hampshire.